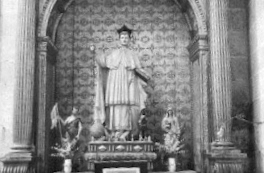 Statue of St. Dominic wearing the Premonstratensian habit (in Spain black birettas were worn) from La Vid. This entry was posted in Former Houses, Norbertine History, O.Praem Saints and Beati. Bookmark the permalink.